On April 1, 2019, the One Day to Protect New Yorkers Act became law in New York as part of the New York State budget. By passing this law, New York has taken a firm stand against the devastation caused by ICE’s cruel and inhumane detention and deportation system. Read the press release here. The One Day to Protect New Yorkers Act fixes a discrepancy between federal and state sentencing law that puts people at risk of immigration detention and deportation. Many federal immigration consequences are imposed for offenses punishable by sentences of one year or more, and misdemeanors in New York are punishable by up to and including one year. This one day overlap between the sentencing schemes affects thousands of immigrants, who can face immigration detention without bail and immigration court with most defenses barred to them due to the misdemeanor offense. This is the case even if someone is never actually sentenced to a single day in jail – the potential sentence is what triggers the consequences. The bill reduces the maximum sentence for New York misdemeanor offenses by just one day. Reducing the maximum sentence from 365 days to 364 days would protect immigrants from arrest, detention, deportation, and family separation. With this amendment, New York would join other states that have recently taken such a step to protect immigrant state residents from deportation for minor offenses, such as California, Washington, and Nevada. 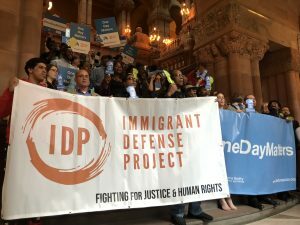 The bill would also restore discretion to immigration judges, who often have no discretion to consider whether someone should be able to stay in the country due to factors like family ties, financial and emotional hardship caused by deportation, or length of residents in the U.S.
IDP launched the One Day for New Yorkers campaign with the Cardozo Law School Immigration Justice Clinic in 2015. We have fought for the bill each year, and in May 2018 we rallied with the Fortune Society, gender-based violence groups, and other advocates to call on Albany to pass this bill. Our statewide coalition of advocates is calling on New York State to take this simple step toward more freedom, power, and dignity for immigrant communities.